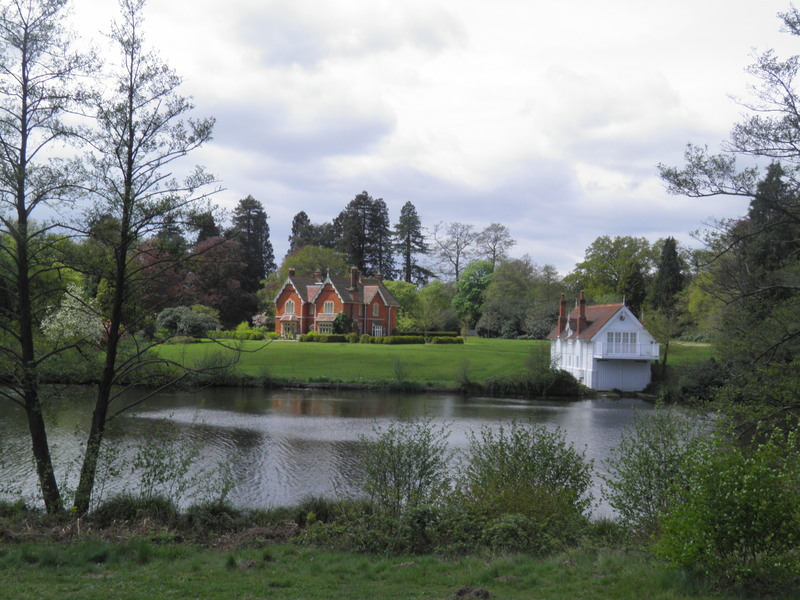 Bracketed by the manicured lawns of the exclusive commuter belt, this walk meanders through pleasant countryside to reach the varied landscapes at the southern end of Windsor Great Park, including lakes, woods, gardens and heathland. 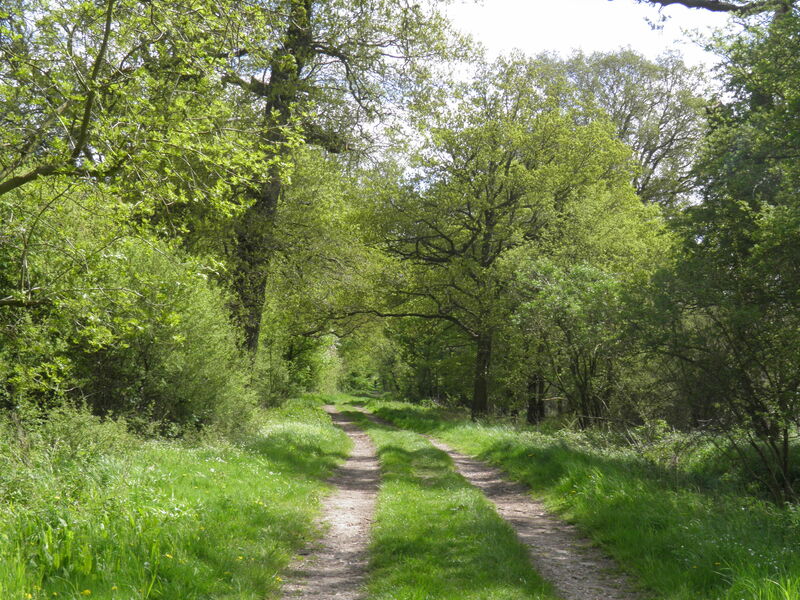 Underfoot: The route is mostly on well made paths, or minor roads. A couple of very brief sections could be boggy, though the worst of these are crossed on broadwalks. Terrain: Very gentle, rolling countryside, with no significant ascents or drops. 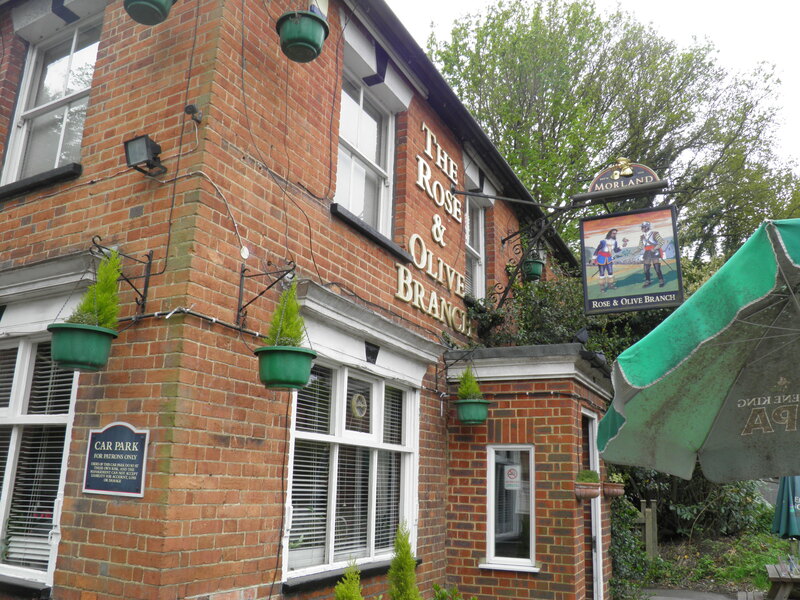 Maps: 1:50,000 Landranger 175 Reading & Windsor and 176 West London; 1:25,000 Explorer 160 Windsor, Weybridge & Bracknell. 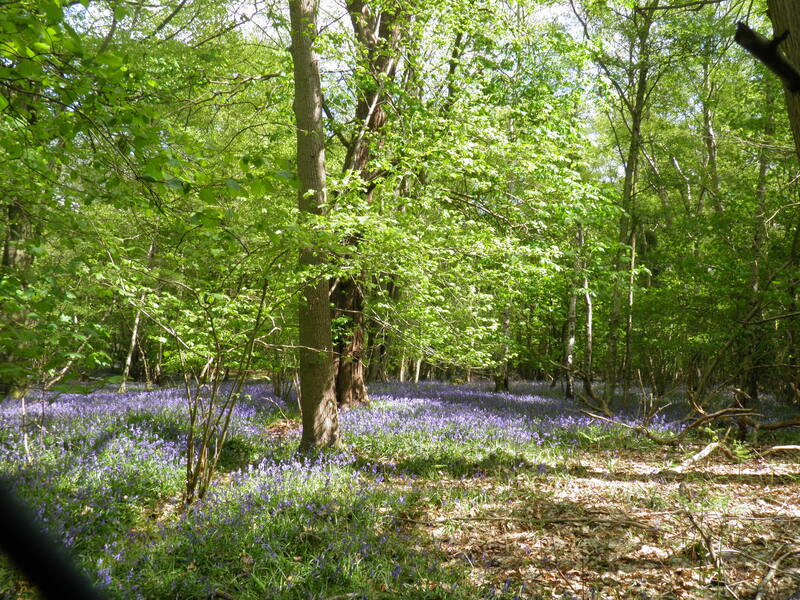 Useful websites: Much of the walk passes through Windsor Great Park, including the fine Valley Gardens. 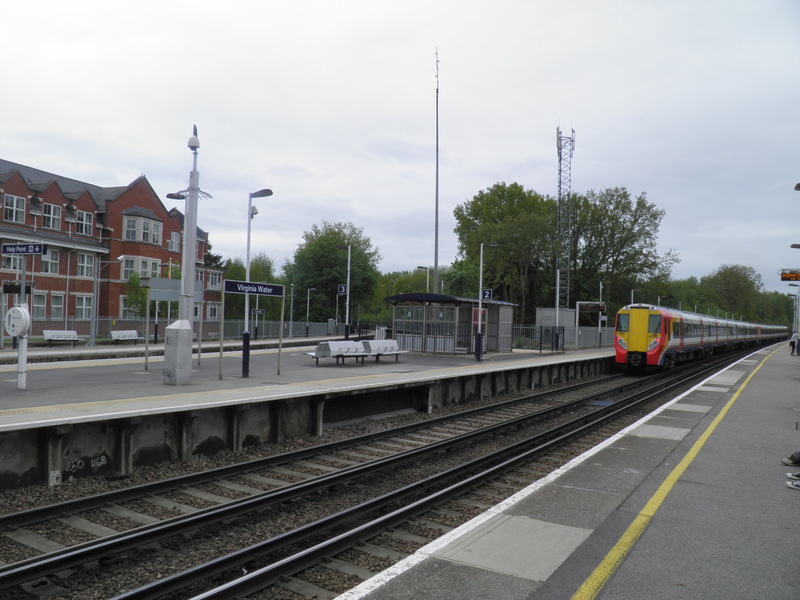 Getting there: Ascot is served by a daily twice-hourly South Western Railway service from London Waterloo (53 mins), via Clapham Junction (45 mins) for connections from London Victoria and London Overground and Richmond (37 mins) for District line and London Overground connections. Getting home: Virginia Water has two trains an hour daily to London Waterloo (there is a third service via Hounslow, but this is much slower and is overtaken by the following direct service) taking 45 mins, via Richmond (26 mins) for District line and London Overground and Clapham Junction (35 mins) for London Overground and connections to London Victoria. 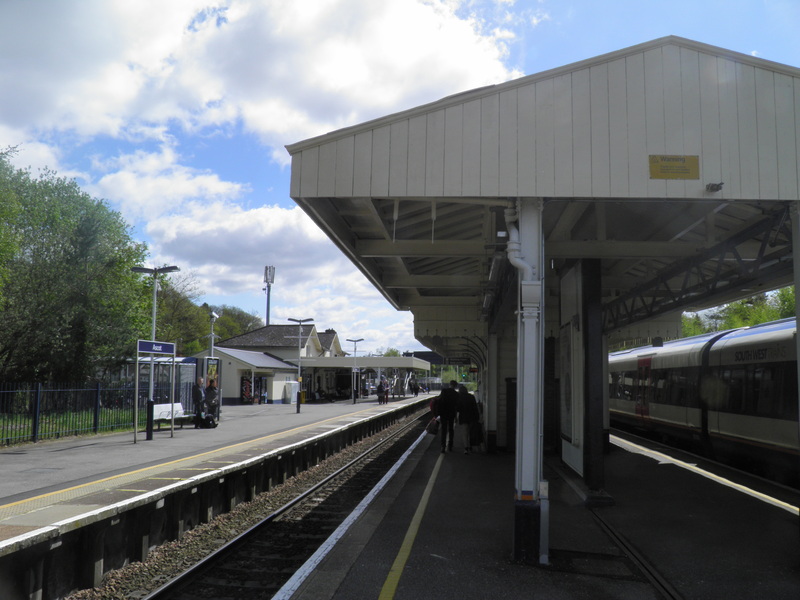 Fares: An off-peak return to Ascot for £13.60 (child £6.80, railcard £9.00) will cover both journeys. (signed to South Ascot). Exiting, keep straight ahead on the road you emerge onto, passing a business park and swinging left to reach the A330 by a pleasant little green. Turn very briefly right along the main road then cross and head left along Oliver Road. Where the road reaches the railway and swings right, instead turn left under the line (byway sign) along a pleasant lane. At a junction by a width restriction sign , head right, following another byway sign. Beyond the woods, the track loops through the grounds of a school. Reaching houses, you arrive at another junction  where you head right on minor Wells Lane to reach the A329. turn left on Cheapside Road for a further 200m. Opposite Queens Hill Rise, turn right through a footgate  to follow a fenced path down the field. Cross the marshy valley bottom on a broadwalk (noting the iron oxide stained stream) and continue straight ahead out of the valley to emerge at the end of a small road by Sunninghill’s church. Cross the road and enter the church car park, following the graveyard wall to swing left on a track. Pass through an elderly iron kissing gate and follow the path between high fences, dropping towards the woods. 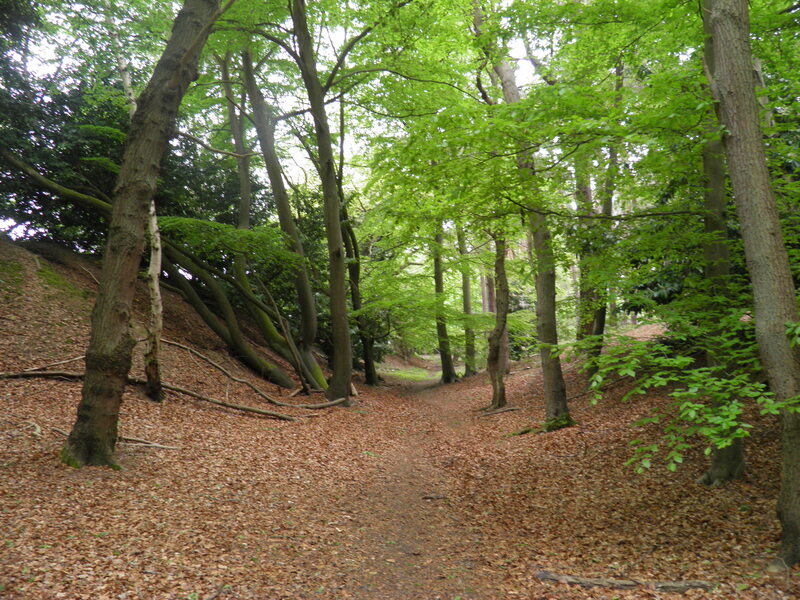 The path skirts round just above Silwood Lake, which you get glimpses of through the trees. for the past 60 years, been the ecological research station for Imperial College – they aren’t keen on you straying into the ecosystems that provide the basis for the research! Imperial College purchased the Georgian mansion from which the park takes its name in 1947, in recent years constructing four new sets of buildings in the park, including a small nuclear reactor for the civil engineering school. There are around 200 graduate students studying here at any one time. Just beyond the lake, you reach a junction of fenced paths , and head left (footpath sign). The path cuts through the woods and climbs past university buildings, followed a little further on by the houses of Cheapside, to emerge on a road at the edge of the village. 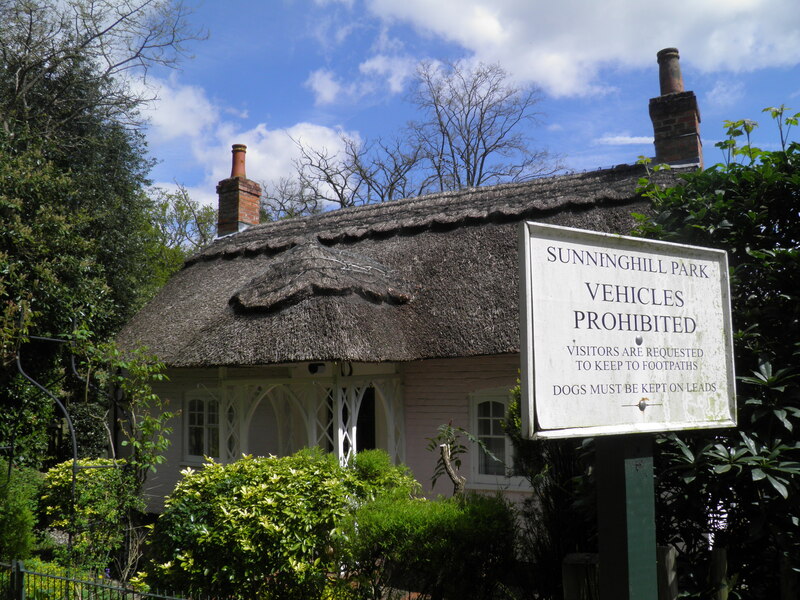 Head left and immediately after the junction with Watersplash Lane, head right beside a thatched cottage into Sunninghill Park (footpath sign). 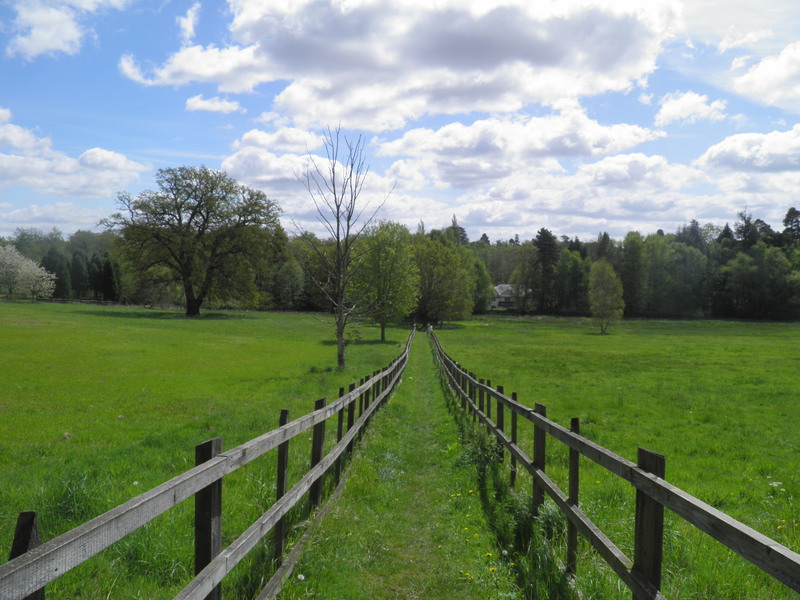 Originally part of Windsor Great Park, Sunninghill Park’s 665 acres was given away by Charles II in 1630. A mansion was built here in the 19th century, and after a brief period as a US Airforce base during World War II, this was repurchased by the crown in 1945, as a home for the then Princess Elizabeth and her future husband, but the house burnt down in 1947 before they could occupy it. In 1990, part of the walled garden was used to build a new residence for Prince Andrew, the first new royal residence for over a hundred years, often compared in style to a Tescos. Prince Andrew has now moved into the Queen Mother’s former residence and Sunninghill was sold, under a rather murky deal, to a Kazakh businessman who allowed the house to remain empty and virtually derelict. Just before the track starts to climb, head right at a footpath sign along an unsurfaced track between the meadows. Beyond a gate, this narrows to a tree-lined path and soon reaches the busy B383. Turn briefly right to reach the white gates leading into Windsor Great Park , turning sharp left through the footgate beside them and following the drive uphill. established when Windsor became a royal residence in the 11th century, and gradually grew as a resource to supply Windsor with wood, meat and fish. Over time, the park’s utility for supplying the monarchy decreased and it became more of a recreational hunting ground. It remained under direct royal ownership (save for a brief privatisation by Oliver Cromwell) until the late 18th century, when George III transferred management of royal lands to parliament. It is now managed by the Crown Estate. 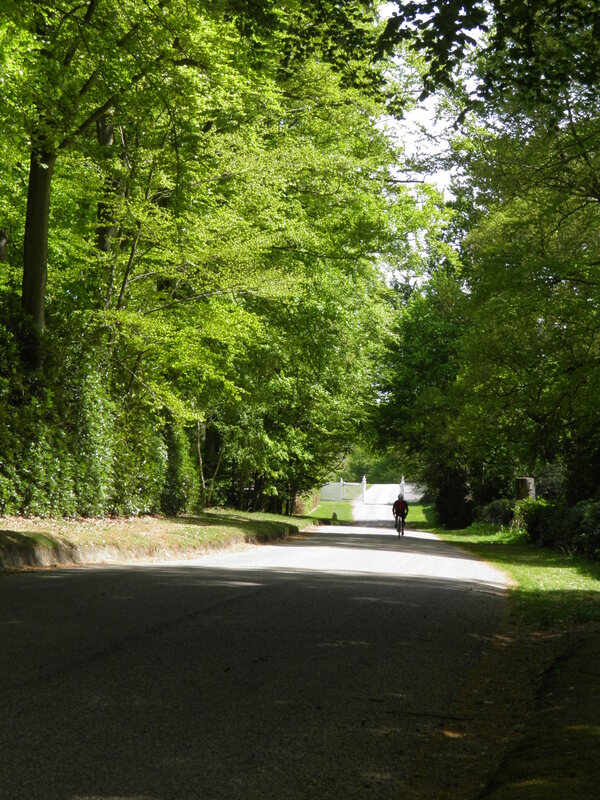 Having been used asthe road cycling venue for the 1948 Olympic games, the park was gradually opened to the public during the 1950s. 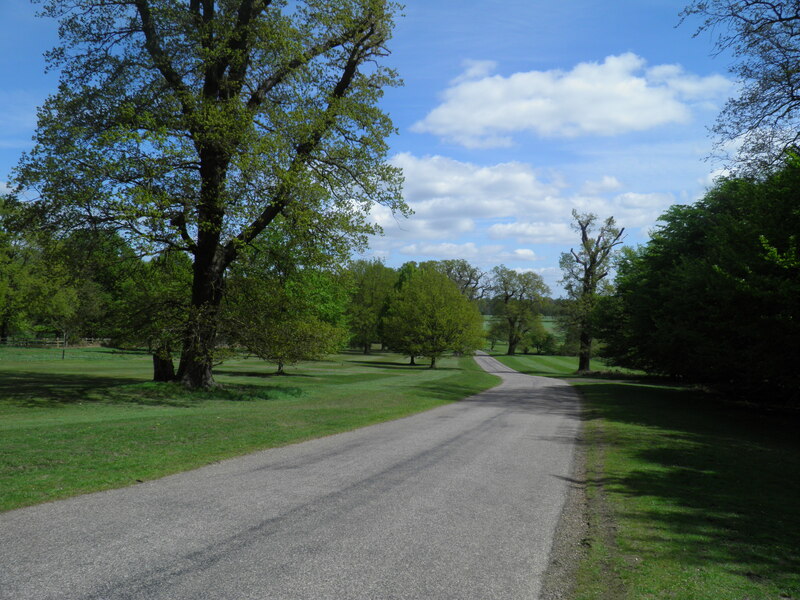 Keep to this main drive as it swings right through the forest before dropping to the lodge house at Prince Consort Gate , which leads into the more open parkland. Nearing the bottom of the descent from the gate, turn right on a sandy ride heading south just inside the trees. Keep to this broad ride, ignoring turns to left and right for a little over a kilometre. When the ride drops to a stream, with a tarmac drive just the other side of a fence, turn left before the bridge  (‘No entry for horses’) on a broad grassy path just above the stream. Before long, the stream has broadened into one of the arms of Virginia Water. War II, the lake was drained, as it could have provided a vital navigational aid for a German air assault on Windsor. Eventually you reach a tarmac drive which has crossed a bridge over the Water . 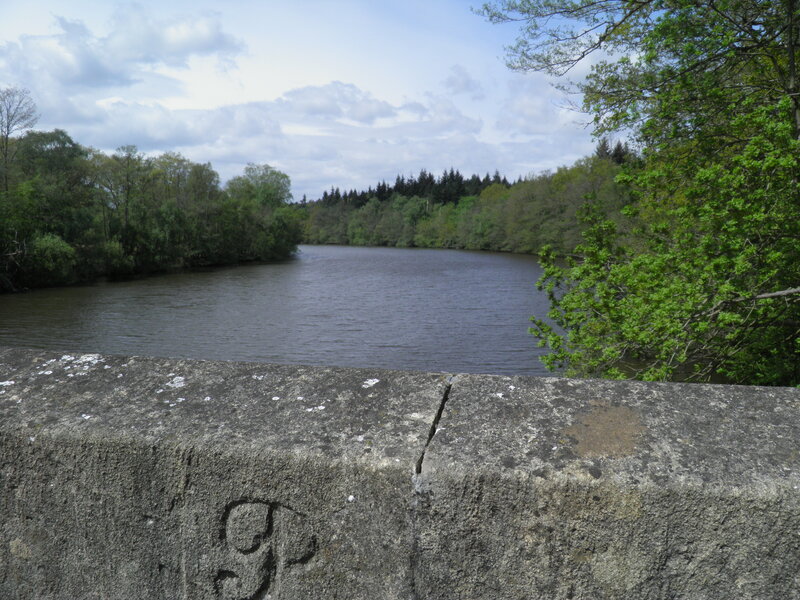 It is worth stepping onto the bridge for the views, but otherwise turn left, joining a broad path paralleling the drive and a ride over a stretch of heathland. The path crosses a pair of tarmac drives  and then cuts across the grass ahead to rejoin the main drive at a causeway over another arm of the Water. the lake. The arm joins the main body of the Water and you get good vistas the length of the lake. The path swings sharply around a small inlet  (ignore the path branching off here) and then runs between tall rhodedendron hedges before re-emerging on the main lake shore. By another, smaller inlet, the path begins to climb . Before it does, veer left up a grassy swathe towards a white pavilion on the hillside ahead (‘Dogs on lead’ sign). stretching across the hillsides above the lake, mainly developed after World War II by Deputy Ranger Sir Eric Savil. Collections of different families of plants are mainly grouped together, often using the parallel valleys as delineation, including national collections of rhododendrons, heathers and camellias. At the foot of the hill with the pavilion on it, turn right up a dry of wooden steps (‘Route to Totem Pole’ waymark) . Keep straight ahead uphill. 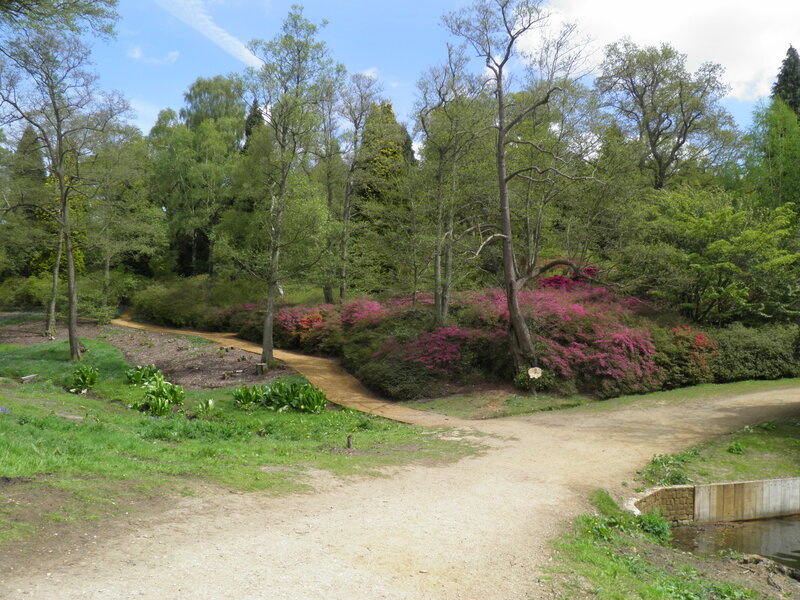 path, heading immediately right to a viewpoint over the Punch Bowl, spectacular with azaleas in the spring. Take the narrow path heading left immediately in front of the view point, swinging round the top of the Punch Bowl. When you reach a short flight of wooden steps on the left, take it, and turn right on the broader path just above. Keep to this main path as it swings left. On reaching a junction of large paths at the foot of a giant redwood tree , follow the red waymarks to take the second right. This broad path soon curves to descend past more redwoods, with the totem pole at the end of the avenue. colony’s centenary in 1958 – it is a symbolic 100 foot high. Carved from a single log of western red cedar, the pole weighs 27,000 pounds and is decorated in the traditional style of the Pacific coast tribes. 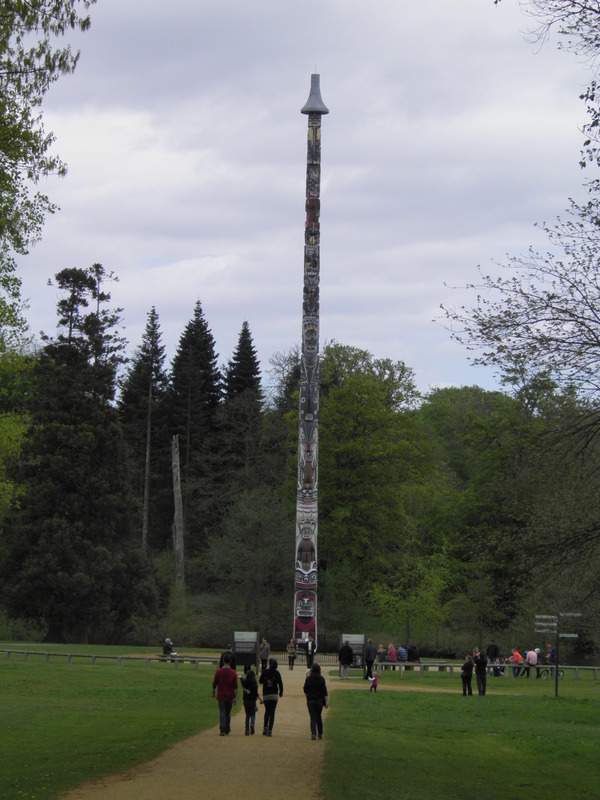 Each figure on the pole represents a clan’s mythical ancestor, including a beaver, a sea otter and a whale. Turn right on the tarmac path behind the pole. Immediately after crossing the Wick Pond causeway , swing left onto the grass to follow the pond’s shore, where you soon join a broad path heading in the same direction, up the valley. Eventually, the path swings left to cross the stream. Almost immediately beyond, turn right  on another broad path continuing along the valley, now through woodland. Keep straight ahead on this path, which eventually veers left and away from the stream, joining a broader path. Approaching a busy road junction, the path forks . Head right to exit the park trough a footgate by the junction. Turn right beside the A30 on the shared use foot and cycle path. After about 400m keep an eye out for a footpath sign on the other side of the road and cross with care to take it. If you reach the entrance to the American Community School, you have gone too far. The path runs through scrubby woodland beside a pond and the American School’s playing fields, before reaching another busy road. sign along a narrow path. Running between fences, the path soon starts to descend quite steeply to a wooded valley bottom, which may be a little muddy in places. Just out of the valley, you reach a footpath junction  and turn right (signed to Callow Hill). The path twists through the woodland, following a high fence. Where the fence ends, the path continues at the foot of a bank to rejoin the road by the Rose & Olive Branch pub. right, recross and take the track ahead (bridleway sign) . You soon reach a T-junction with a tarmaced drive and turn left (again following a bridleway sign). Pass an old age people’s home and a gated mansion. Shortly after this, veer right on a tarmaced path (waymark) . This quickly becomes an earth path through the trees, dropping to the end of a minor road . Leave the signed bridleway here and head right, downhill on the road. At the junction head left on Pipers End, passing a very wide range of costly houses. At the end of the road keep straight ahead on the gravel path , keeping to the narrow path ahead at the junction (‘Estate Footpath to Trotsworth Avenue’). This quickly brings you out at the end of a slightly less exclusive suburban cul-de-sac which you follow, descending slightly. leads you out onto another small road. Turn left and by some garages turn right, passing apartment blocks. Beyond them, cut left down a small path through the hedge to reach a main road. Cross and take the road opposite, turning left at the end on Station Parade, which leads in about 200m to the station. Fast London trains normally depart from platform 1, but check the station departure boards. Pingback: Does Your Child Have Nature Deficit Disorder? 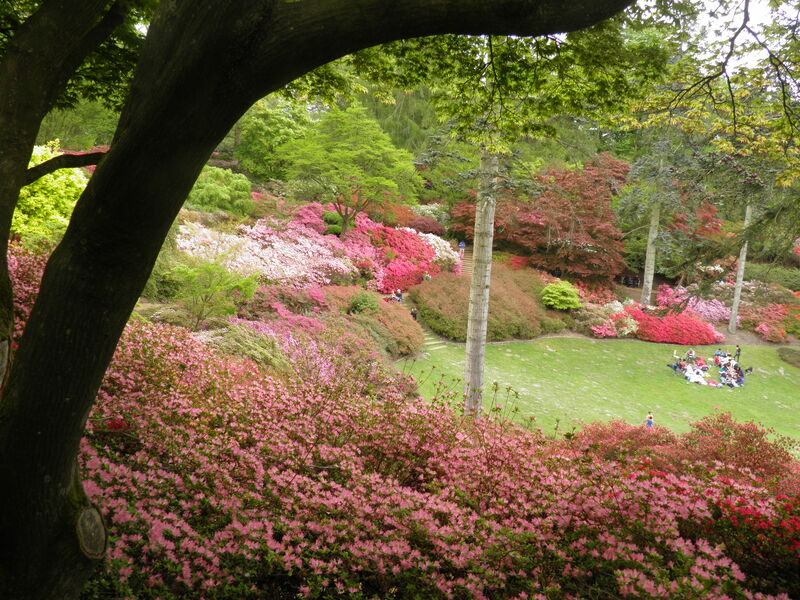 Just went on this walk yesterday (late May) and wow…the rhododendrons were absolutely spectacular! Cannot recommend the walk enough, particularly in the spring season, when the flower as in bloom. The river going through Windsor Great Park is also stunning. One of the best walks I’ve been on in the UK. A brililant walk, varied and with even the suburban sections very interesting; thanks so much for posting such helpful detailed instructions. Just a warning that crossing the road is challenging at two points – the busy A30 just before the American Community College, and (even nastier) the minor road on the bend just before Point 20. Don’t drink too much at the pub just beforehand!